Subscription services currently make up the largest share of online video revenues, but advertising-based services will take the lead by 2020. The global over-the-top video market is poised for nearly exponential growth, says a report by London-based Digital TV Research Limited. It forecasts that global OTT TV and video revenues will climb to $64.8 billion by 2021. That figure includes projected revenues for 100 countries. The industry took in $29.4 billion in 2015 and $4.5 billion in 2010. The greatest share of that total will come from the United States, where revenues will rise from $8.2 billion in 2015 to $22.8 billion in 2021. China will come on strong, quintupling its current revenues to reach $6.2 billion by 2021. Most online video revenues will come from subscription services (SVOD) through 2018, but Digital TV Research predicts that advertising-supported content (AVOD) will take the lead by 2020. At that time, AVOD revenues of $15.4 billion will surpass SVOD revenues of $14.6 billion. By 2021, there will be 383 million SVOD subscriptions around the world. The number was 21 million in 2010, and 163 million at the end of 2015. This figure counts gross subscriptions, points out Simon Murray, principal analyst at Digital TV Research. It's common in some countries for a household to have multiple SVOD subscriptions. "Subscription figures for several countries (notably the U.S., Germany, and the U.K.) are boosted by the inclusion of Amazon Video. Most of these homes access Amazon Video as part of their Amazon Prime subscription so they are not directly paying to receive Amazon Video. A significant proportion of Amazon Video viewers would probably not pay for it as a separate service," Murray notes. 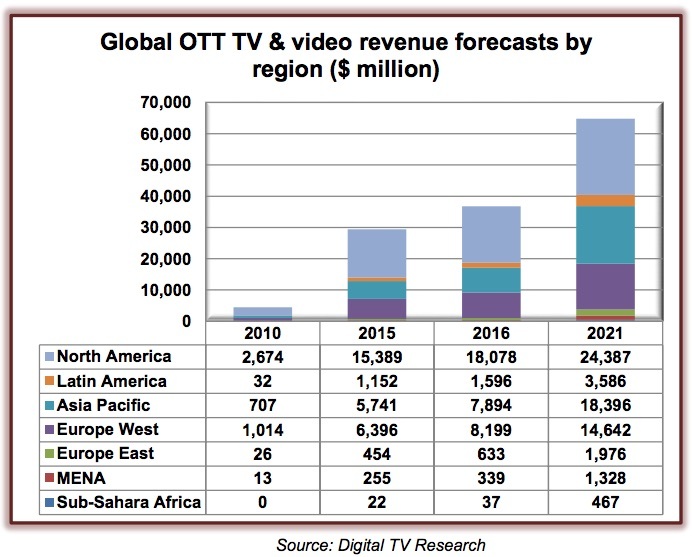 The data comes from Digital TV Research's Global OTT TV and Video Forecasts report.